Maria Roldes Dobasio and her younger brother Gionardo stopped over at Incheon International Airport on the way back home from Greece and Turkey to the Philippines recently. As they had a three-hour layover, they decided to join a transit tour package. Of the various tour packages offered for free 11 times a day at the airport, the Dobasios opted for a two-hour course that let them choose between either a municipal museum or a war memorial hall and Heungryun Temple. The tour began with them learning some basic Korean phrases on the bus, such as greetings and asking about prices. The tour bus first arrived at a memorial hall commemorating the Incheon Landing Operation led by UN Commander in Chief General Douglas MacArthur during the 1950-53 Korean War. The hall explains various aspects of the war including its cause and the armistice that finally stopped the fighting. The Dobasios were able to take photos in front of the weaponry and military uniforms of the participating countries, among other well-preserved artifacts. "I'd heard of the Korean War, but I didn't know the details," Maria said. "Everything about the war was explained there in a number of languages, so I could learn about it. I was particularly impressed by the three-dimensional miniature of [MacArthur's] landing operation." Afterwards, the tour bus spirited them to Heungryun Temple. Maria bought a small sculpture of a child monk at a souvenir shop and put it on a rock to make a wish. Looking back on the tour, she said she got a great return on her investment considering how much she learned about the country in such a short timeframe. 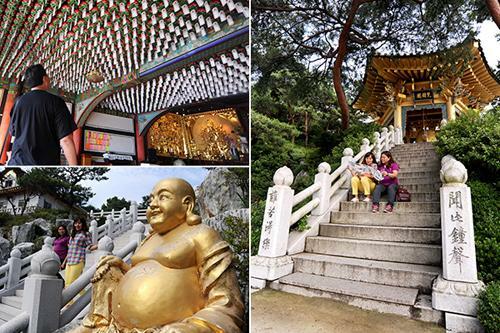 Other tour packages include a three-and-a-half-hour trip that takes in Wolmi Park and Incheon Port, an early gateway for foreigners to enter the country; and a five-hour trip to Seoul. 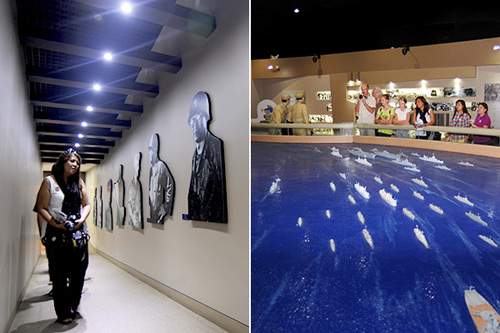 On weekends, transit passengers also can tour a K-pop-themed exhibition hall in Goyang, Gyeonggi Province. Other options include trips by Maglev to Yongyu Islet in Incheon and by Airport Express to Seoul Station in the heart of the capital. 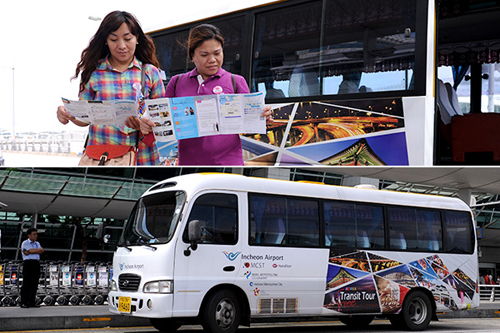 For more information, either visit the transit tour desk in front of Gate 8 on the first floor of Incheon International Airport, call 032-741-3139, or log on to http://www.hanatouritc.com.